Roasted cauliflower done buffalo wing style in a spicy hot sauce! 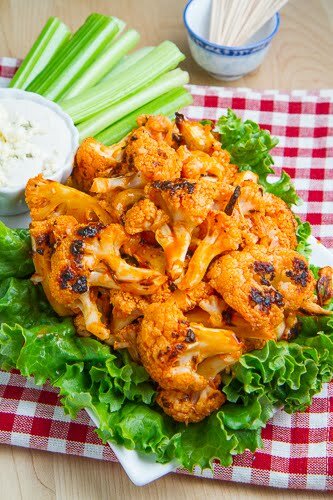 If you are a fan of buffalo chicken wings and you like cauliflower then you just have to try this buffalo roasted cauliflower! 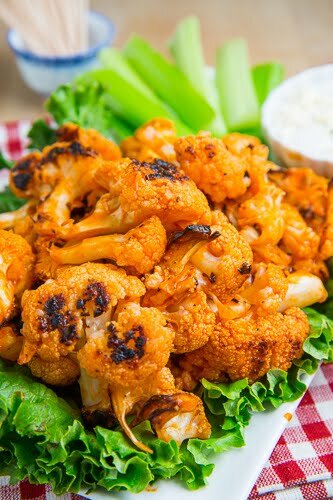 Roasted cauliflower has to be one of the most addictive healthy snacks around and it only gets better when coated in buffalo hot sauce! This spicy treat would be a perfect option for a lighter and healthier snack for your party for the big game! 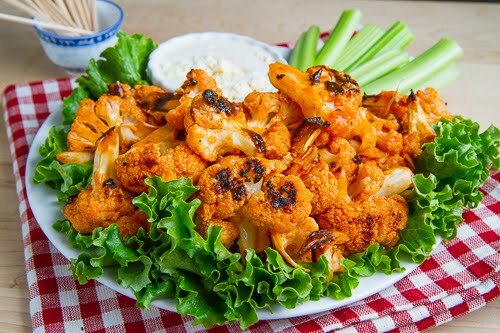 Not only does it taste great but it is as easy to make as roasting the cauliflower and tossing it in the buffalo hot sauce so you can be licking your fingers clean in as little as 30 minutes! 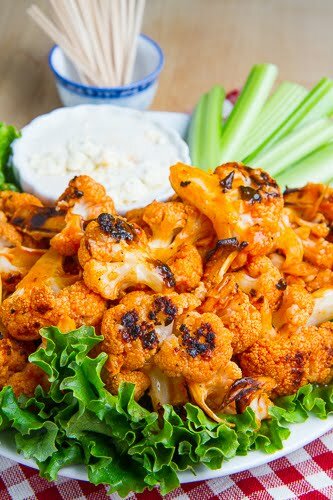 Just like buffalo chicken wing, this buffalo roasted cauliflower goes great with a tangy blue cheese sauce for dipping and some crunchy celery sticks to help tame the heat! Serve with toothpicks to avoid messy fingers. Toss the cauliflower florets in the oil, salt and pepper, arrange in a single layer on a baking sheet and roast in a preheated 400F/200C oven until lightly golden brown, about 20-30 minutes. A great idea! A wonderful way of preparing this delicious vegetable. I saw this on the Rachael Ray show the other day! Great idea. Think I will try soon. Carried away? Nah, I don't think so. Carry on! I've subscribed to your blog for quite some time. I have subscriptions to at least a hundred other recipe sites and I am constantly adding more and/or deleting them (for various reasons but mostly because of inserting politics into a post. I don't want recipes to call for anything but conservative/liberal addition of ingredients.) but this one is a keeper! I made this and it was OK. I thought the hot sauce was overwhelming for the mild tasting cauliflower. Personally, I like it mashed (like poatatoes)with chives and tarragon. It was a pretty dish and different, and probably something most would find tasty. I found another recipe for cauliflower marinated in yogurt and curry spices for at least 3 hours, then roasted. It was supreme. I made this about a week ago and everyone gobbled it up! I choose this over buffalo chicken any day! This is perfect for the vegetarians at Superbowl. Wow. this is such a great idea for an appetizer idea to serve for vegetarian guests. Thanks! This is GORGEOUS. I just made some thing very similar, but I want 14 platters of yours. I love spicy food and I'm always looking for new ways to use cauliflower. Cool idea! Whoa. Now there's a good idea. I'm already a cauliflower fan, but this could convert anyone. I made this tonight and it was delicious! I think I could eat the whole head all by myself. Thanks! Your photos look wonderful – so does the food. What a great idea for cauliflower; I'm going to make this. Thanks! Wow so many dips all at one place. Party Heaven. My fav is cauliflower. Kevin you are a ROCKSTAR! I would have never thought of this but it was soooo good! I didn't do any dipping, but tossed it with the sauce and sprinkled the healthy, low-cal cauliflower with blue cheese. AMAZING!!! Adding this to the recipe list when we start to harvest our cauliflower, thanks for sharing! Made this recipe tonight in an attempt to get the kids to eat more veggies, and they loved it! The husband also liked it. Ill be making these regularly. Kevin, you never cease to amaze me! Thanks for vast collection of 'buffalo' recipes (not to mention ALL the others) you've shared with us. Keep up the little kitchen cooking!! I've made and this and it is phenomenal. Big fan of cauliflower anyway, but always looking for new ways to prepare. My kids LOVED it! What a great healthy alternative for super bowl snacking! Love Love Love this! So does my entire staff! This is fabulous – making again tonight, luv it! Made this a couple of weekends ago when I was craving buffalo wings but had no chicken. It was FANTASTIC! Just made this recipe – it is awesome!!! Buffalo is a city, not an animal…so when you refer to Buffalo chicken or Buffalo cauliflower, you should capitalize it. Think Chicago pizza! And, all Buffalo-style food is always eaten with blue cheese. Ranch is NEVER used in Buffalo…ever! When you list 'hot sauce' what type of sauce are you referring to please? If you could maybe tell me what brand/type you use, I can look it up and see if we have an alternative here in Oz. I'd hate to cook this only to mess it up by using the wrong sauce! P.S… Love your recipes! I have several of them on high rotation! Megs: I'm glad you have been enjoying my recipes! I usually go with franks red hot with this recipe! Can you use frozen cauliflower for recipe? Cannot get blue cheese or ranch dressing here. Do you have any.suggestions? Besides moving to America. Joke!!! I don’t know how to make those dressings. Vould you help. I’m sorry to be such a pain in the a neck.